The five people on board are believed to have died. ALL FIVE PEOPLE on board a Russian military helicopter that was shot down over Syria today are believed to have died. “A Russian Mi-8 military transport helicopter was shot down from the ground in Idlib province after delivering humanitarian aid to Aleppo,” the ministry said in a statement. There were three crew members and two officers from the Russian reconciliation centre in Syria on board. “As far as we know from the information we’ve had from the defence ministry, those in the helicopter died, they died heroically, because they were trying to move the aircraft away to minimise victims on the ground,” he told journalists. Photos shared widely on social networks by Syrian opposition activists purported to depict the smoking craft in the desert and personal belongings of those inside, including Russian drivers’ licences, passports and insurance cards, as well as Orthodox Christian icons. Today’s downing brought the toll for Russian soldiers killed in the Syrian conflict to 18. In the most recent death, contract soldier Nikita Shevchenko was killed in a mine blast in Aleppo province while accompanying an aid convoy, the ministry said on 22 July. 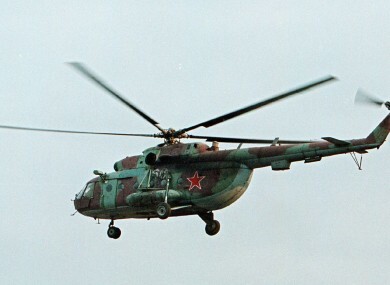 Email “Russian military helicopter shot down over Syria ”. Feedback on “Russian military helicopter shot down over Syria ”.